Ask me where to get the best scones and Regent Singapore will be rattled off the top of my head. There may be a lot of other great scones but my goldfish memory only retains the most memorable ones, and I can never forget the light fluffy texture of their scone paired with buttery clotted cream and lemon curd. 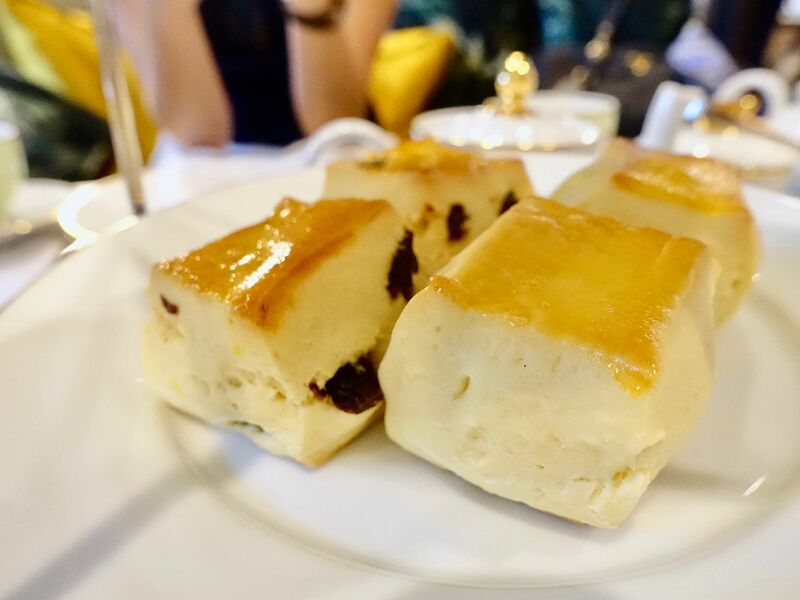 Thankfully the renovation at Tea Lounge at Regent Singapore did not take too long and you can now enjoy their lovely afternoon tea in a more contemporary colonial garden setting. 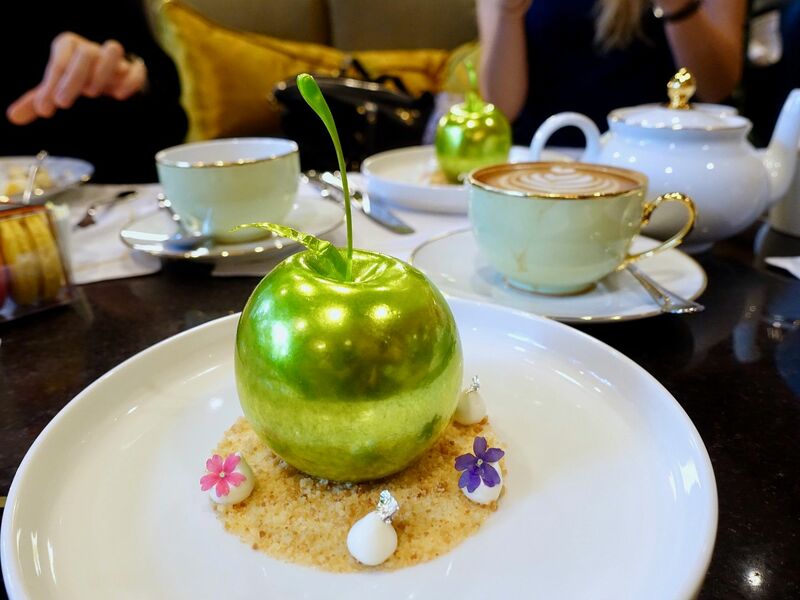 Interactive and theatrical elements have also been added to Tea Lounge's repertoire of delightful bites for their Weekday Three-tier Afternoon Tea. 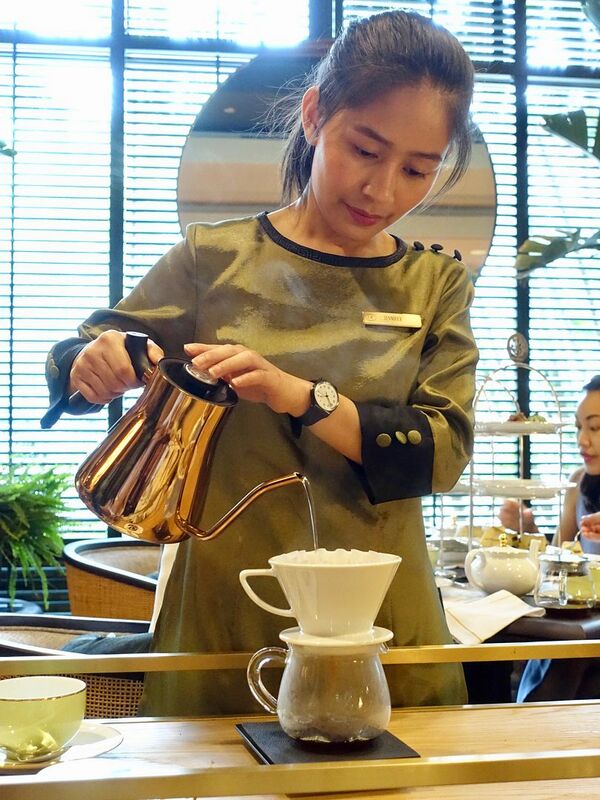 A table-side trolley service provides hand-brewed coffee and special tea blends, brewed to perfection at their optimum timing and temperature; while award-winning Pastry Chef Alex Chong and his team conjure some sweet dreams for the dessert course you pick from the menu. First things first, the scones! I knew something was different when i bit into them and i confirmed that the recipe had been tweaked to produce a slightly denser scone that doesn't break apart so easily. I can't tell it i liked it better than the previous version, but i did enjoy it very much. The scone has a nice crunchy crust all around but still retained a moist center. Of course, it was perfect with the Devonshire clotted cream and smooth-like-butter and not-too-sweet lemon curd. There's also a house-made strawberry preserve that's served but i'm simply not a jam person. We were also huge fans of the seasonal quiches, which were the best savory items on the tiers. That amazing snappy buttery shortcrust held the moist egg custard with heirloom summer tomato and cherry wood-smoked ham. The rest of the petite savory bites sounded fancy with their extravagant ingredients but failed to deliver. The best of the lot was the sweet Alaskan king crab wrapped in watercress crepe, and the smoked Norwegian salmon with caviar on beetroot loaf. The open-faced Wagyu Beef and Lancashire cheese with Périgord black truffle sandwich was dry and bland; and the Duck Breast and Lavender infused Foie Gras Terrine on tart had a slight gamey flavor to it. Needless to say, i could not be bothered with an egg sandwich as it affords no satisfaction at all. Each tea set is accompanied by two cups of coffee/tea typically. You could opt for a Manhattan Bar-inspired tea mocktail or cocktail. I started with a pot of white tea (which turned out to be way lighter than what i preferred) and ended with a pour-over coffee to go with my dessert course. The chefs worked on our selected desserts at the Chef's Work Table. These desserts are served à la minute and took a while to prepare. 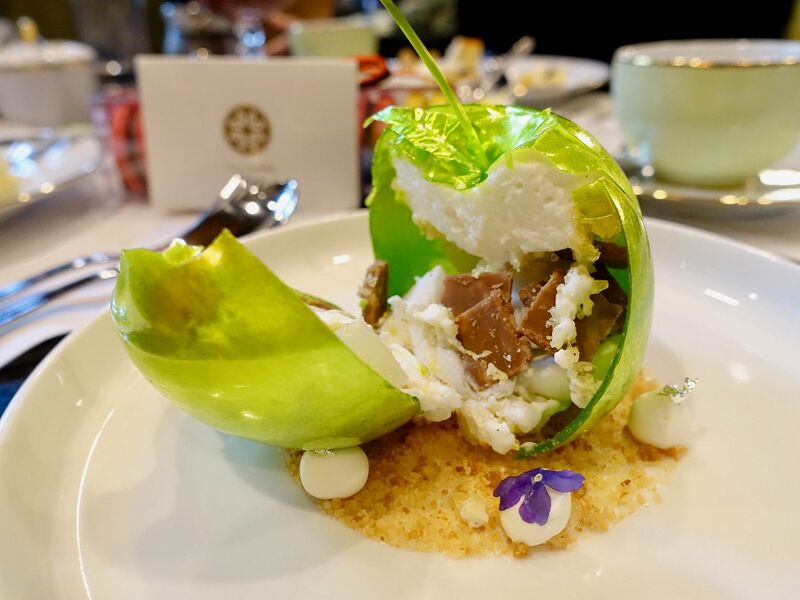 The Golden Apple was blown from a green apple candy and then filled with an ice yuzu apple compote, yogurt espuma, hazelnut molasses crumble, olive oil sponge and vanilla Fromage Blanc sorbet. It sounded like a really sweet dessert but the filling of yuzu compote and cheese sorbet helped to balance the sweetness from the candy. 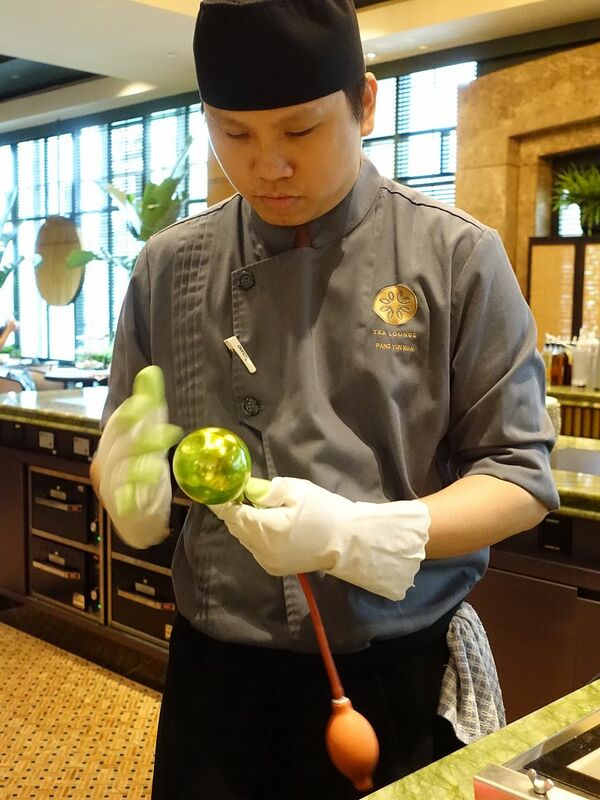 For a more Chinese take on the desserts (i.e. 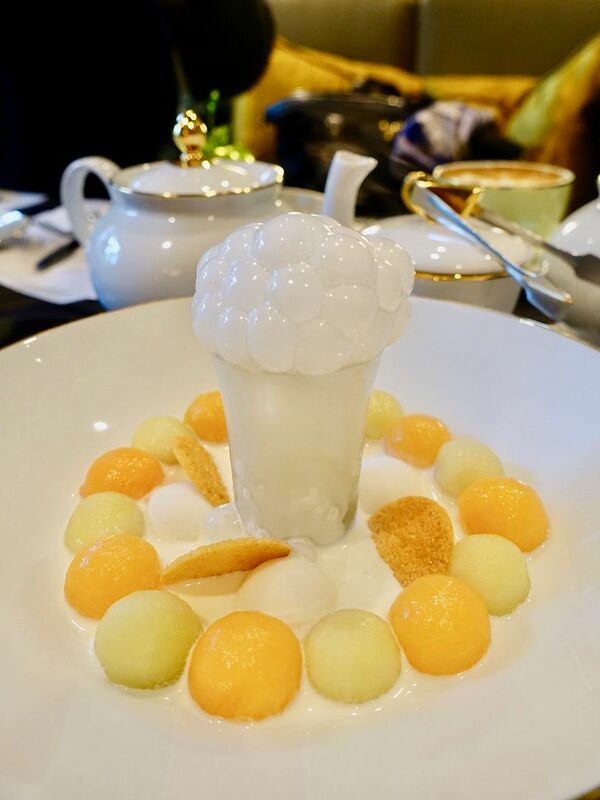 Coconut-Sago-<insert fruit>), have the Coco-Melon Symphony which bubbles coconut smoke as you dig into the creamy mixture of coconut semi-liqueur, coconut sorbet, with the various melon balls and Japanese pearls. For the more conventional, there's also a decadent Chocolate Forest, and Raspberry Soufflé. 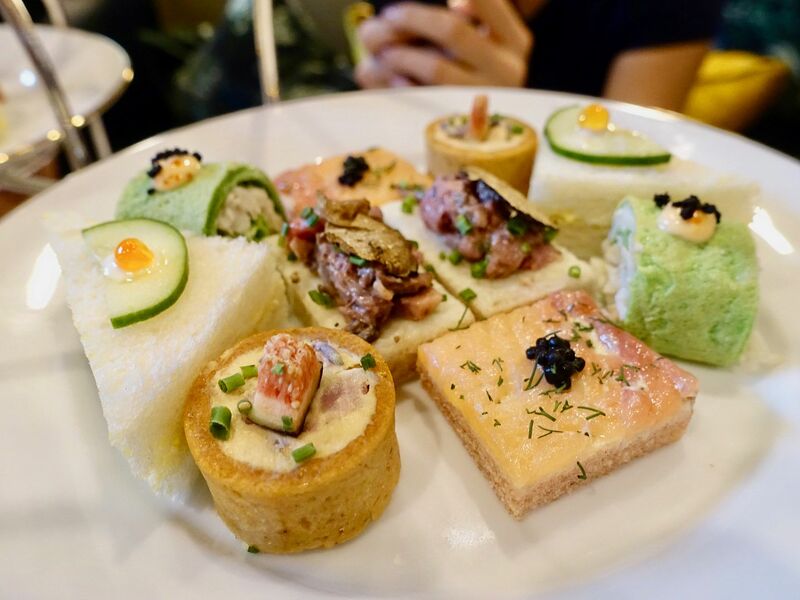 I have mixed reservations about Tea Lounge at Regent Singapore's Weekday Afternoon Tea mainly because the savory bites were utterly disappointing. My recommendation would be to go for the scones and perhaps their specialty desserts if they are made available a la carte. At $48/pax, i would rather go to Fullerton Bay Hotel The Landing Point, or Mandarin Oriental Axis Bar for tea. 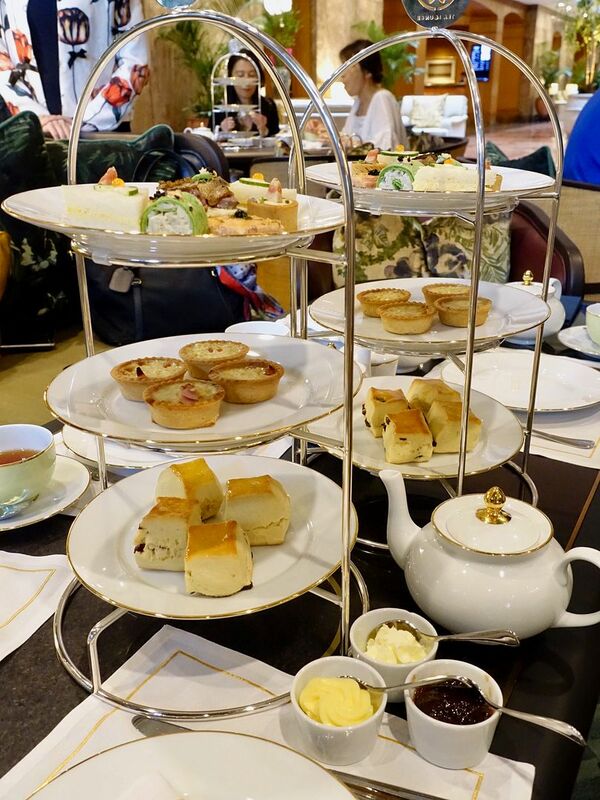 That said, Regent's Weekend High Tea Buffet ($61/pax) which features local flavors sounds more tantalizing. Expect Lobster Laksa with Rice Noodles and X.O. Sauce; Peking Duck Egg Pancake with Regent BBQ sauce (one reason why friends decide to hold their wedding banquet there); Caviar station and more. Plus you can have all the scones you want!